Bad guys're almost always more fun then heroes, unless that hero has ham, salami, and prosciutto. 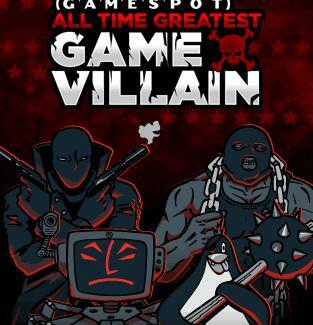 Because most don't, there's GameSpot's All Time Greatest Game Villain bracket showdown, offering you the chance to win untold video game riches, which we will actually tell you about almost immediately. Apparently not too shamed by losing to every one of them at some point, the gurus at GameSpot schemed up the ATGGV, a 64-bad-guy, March Madness-style bracket that lets users vote on who makes it through each round up to the final showdown, but not the Final Countdown, cause that's over in Europe or something. Just stop by GameSpot to make your picks (then head back between 8/26 and 9/23 to support your evil pals in round-by-round voting), and you'll be entered to win a mighty circuit-filled bounty: a 3D HDTV and all three major gaming consoles plus two games for each, aka the Ultimate Home Gaming Setup, which you previously thought was Stratego and some girl who works with your buddy's gf that "you'll just totally flip for". Sample first-round throwdowns: golden oldie Donkey Kong v. Golden Axe's Death Adder, Resident Evil badass Albert Wesker v. Sonic's Dr. Robotnik, and Sweet Tooth from Twisted Metal v. Carmen Sandiego, who's hoping to steal a victory, or failing that, the Mason-Dixon Line. So be sure to fill out your ATGGV bracket at GameSpot.com by this Thursday, August 26th, lest you miss your window and're forced to come up with an excuse on why you didn't enter, which everyone will know is just bologna.